First and foremost, Merry Christmas to those celebrating! I've spent a portion of today updating our user profiles. Services have been moved to the top, under the map so that they are more easily accessed by users who visit your profile (suggested by Beverly). In addition, Want to Buy and Want to Trade listings have been added in a tab-style display. Social buttons have also been added and you'll be presented with a popup to promote your profile when you first visit it. Awesome, the profiles look much better this way. 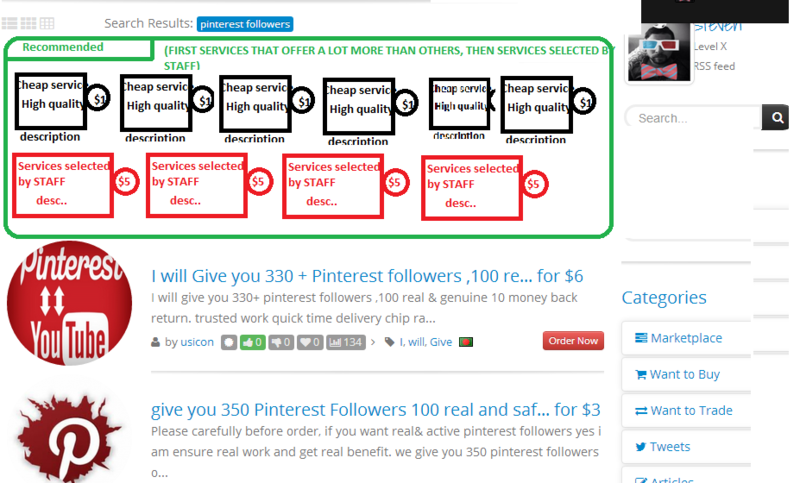 I like the way the services are positioned higher on the page so they are what get noticed first, great job. Now It Look Very Cool And Smarter Then Before.Thank Jorder For This Update And We Want More Update In Few Things.In Local Time Auto Detect And An Mobile Apps.This Is Very Impotent Now For Us.I Love SEOClerks So Much And Looking Forward For More. Yeah, I have timezone partially implemented. I started working on it but never finished it (I get sidetracked easily). I think we also need a forum for suggestions where the next thing I work on is the most voted/requested feature (instead of what I pick out of my dev todo list). Thoughts? thanks sir this is surely help full to us. The main utility of it is now the service titles are visible directly and it works nice with mobile view. This is a welcome update. Thanks. Now the profile looks really nice.it will be very helpful.Thank you jordan. I suggest you jordan rollback this look to older look. WOW! Great move Jordan, we wanted to suggest this too! It's good to see that you read users suggestions. We'd love to see you create a new feature which will benefit all the sellers here on SEOClerks. We have 2 suggestions for you. So when a DJ comes to my profile, they can select SoundCloud and only soundcloud services will be shown. It's not a really good screenshot but you will figure it out, i'm in hurry! Please check the above post Jordan! Buyers at the moment, when they search for services, they can't find the BEST services on the page, all they get is a list of new services. While it's good to have new sellers getting sales, it's even better to keep them get sales, while we, the best users on SEOClerks with services reviewed by Staff, also get sales on our services. P.S. The "RECOMMENDED" services must be relevant to the search keyword. In the recommended services, there can also be services having more than 100 or 200 positive reviews. Guys, please check my posts above and let me know what you think about the new features i suggested. It am sure that it will also help you and each other user on SEOClerks get more sales. Glad you liked my suggestion. It will bring more sales to the sellers here on SEOClerks and it will be much easier for buyers to find the services they are looking for. I hope that i will have more people supporting me so Jordan can add this feature as soon as possible. Cheers! I just want to say that Steven is really on to something here. It would be awesome the see something like the things he mentioned. Buyers would sort another users services in the seller profile? Is that what you mean Steven? Hello Robert, no, i was thinking the opposite. We, the sellers, will collect OUR OWN services, so when buyers come to our profile, they will have more detailed view - they won't miss the services on Page 10. Instead going from page 1 to page 10 and back to page 7 to find a service for SoundCloud Likes, they can pick the tab for SoundCloud Likes and get only the SoundCloud services for LIKES. Hey @Steven, I really like your suggestions. I am also with you! I hope these will be implemented soon. I couldn't agree more with that, how would the vote/request system work? like would there be multiple polls in one thread? You guys just keep making this a more pleasant place to conduct business. Great work! Thank you. Nice looking new profile. Really good work Jordan. Is it possible to allow user to create own coupon code? Because once I get affiliate I plan to give free money of 2$.And I am also planning to give free money to users here in my balance as I have reached levelX last week. Awaiting your reply mate. Great suggestions guys. If you don't mind, submit them as a new thread in the suggestions area for now. I'm unsure. For now I was just thinking the threads in the suggestions area that has the most positive replies. I'm not sure if Xenforo has a up vote plugin, that would be ideal. Any ideas? You mean as a purchase, like a coupon gift card? Jordan, i am also interested in something like this. I want to give some users FREE MONEY for example $100 free money that they can spend on my services or services with my affiliate links on my affiliate website. So, when they get $100 in their balance, they can only spend them through my affiliate website or on the services i have selected (my services). I won't be getting paid for those money, they won't clear in my balance, i will be doing the service for FREE, but it sounds better if it says free money. So SEOClerks won't lose anything in this case, only i am losing time working for free, but i will be getting more and more affiliates. I will be writing exactly in details about new features after the holidays. Great update, thank you so very much Jordan! Yes I want to give Gift card. Is it possible to allow user to create own Gift card code ? Because it helps us to gain more affiliates to our site. I will give the Gift card to new members so that they can redeem and add the funds to their balance. I like the idea of the forum to make suggestions. I think that this will help out quite a bit. After updating profile it looks really nice.